My first-ever balloon flower! Platycodon grandiflorus 'Sentimental Blue', planted last fall. SO cute! My hibiscus thankfully turned out not to have ugly peach flowers. Instead it has foofy double flowers. I will learn to like it. It definitely makes a dramatic statement! Okay, bintie, get back to work!! Love the balloon flower, don't forget to feed hibiscus acid they'll bloom like crazy! I too love wondering in the garden with a cup of coffee, can't get myself to like tea how funny is that? Have a great weekend! I used to grow Balloon Flower before I killed it somehow. Attempt number 2 commenced last fall, and the new plant is just now starting to form buds. 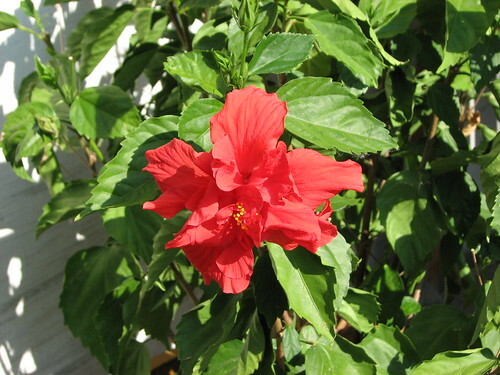 I'm surprised your Hibiscus is blooming already. It's a great color, obviously visible from space. 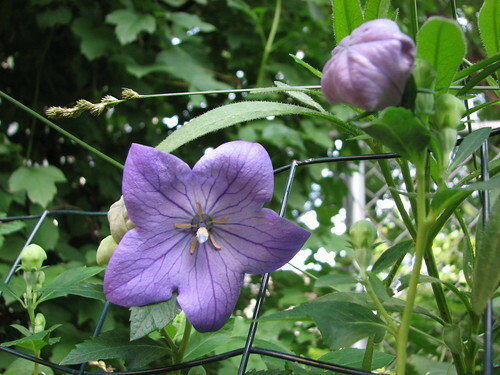 I haven't grown balloon flower in a long time. After I saw them at the medicinal garden at UIC last year I told myself to grow them this year, but I forgot! I'll have to make a note (on paper) to get some seeds for next year.